World Of UFO: Multiple UFOs Over Jerseyville, Illinois, September 9, 2014; Do You Beleive this ? 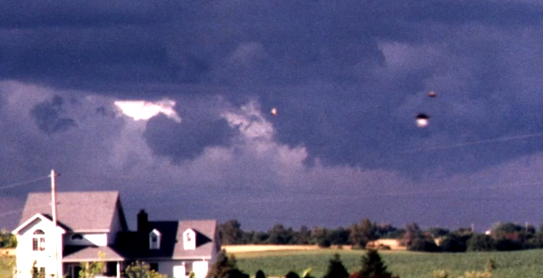 Multiple UFOs Over Jerseyville, Illinois, September 9, 2014; Do You Beleive this ? There was an incredible UFO sighting in Jerseyville, Illinois September 9th, 2014. As you can see in the video and the photos, there was more than one and they are very odd looking and seem to stay in one place. Many have been pondering the meaning of all of these sightings that have been taking place, as of late. Is this some sort of galactic feeling that something big is about to occur? You can see there’s a storm on the horizon and one must wonder if that was the attraction for this visit. Was it the storm that brought them in? Roswell Was Not Aliens, It Was The Nazis?